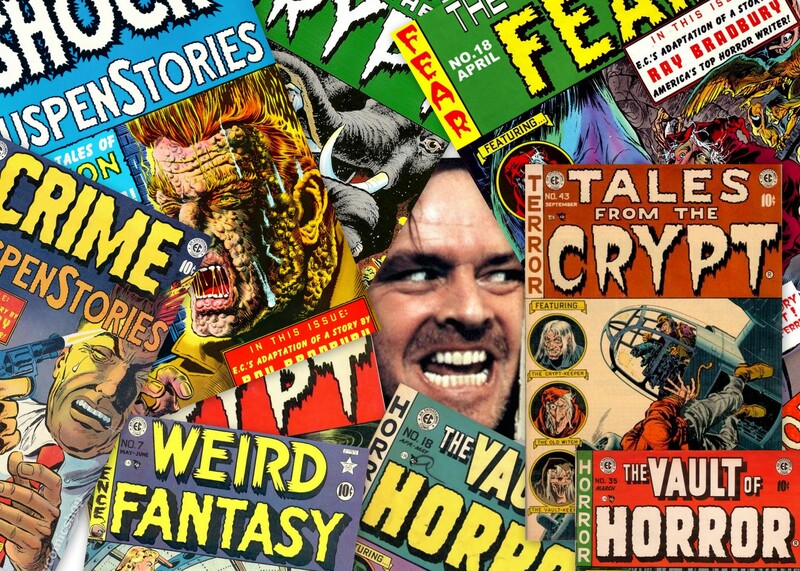 For the next couple of weeks I burned as much time as I could at the photocopier, running off thousands of pages from Vault of Horror, Crime SuspenStories, Vault of Fear, and Tales From the Crypt comic books. I stuck them into fat black binders, and Michael and I started reading them. The idea that a veteran writer like Michael wanted me as a partner was flattering. I hadn’t written a thing since leaving Savannah and art school, and I’d never written anything worth reading. I was a writer only to the extent that I told people that I was a writer, not because I actually wrote. But Michael saw something there. What it was eluded me. “You’re sure you can get a script to the producers?” he asked. “Yeah, pretty sure,” I said. The Tales episode being edited on the Paramount lot was finished, the thousands of feet of film sealed into cartons destined for a storage facility in the San Fernando Valley just as soon as I could load them up. I walked past Jack Nicholson’s parking space for the last time, and for the first time a gleaming Mercedes convertible filled the space. I couldn’t wait to get home and tell Jody that I saw Nicholson’s actual car. I stepped into the empty alley, on my way to the external staircase that led to the cutting room. A man stepped out of the door near the foot of the stairs. If a Jack car sighting was a thrill, an actual Jack sighting was like winning the fanboy lottery. The big man stood directly in front of the stairs: Not only had I spotted the wily Nicholson in its native habitat, but if he didn’t move before I covered the next hundred feet I might have to talk to him. But what would I say? Hi, Mr. Nicholson. I’m a big fan. Wait, wait? What the hell am I doing? We’re both in the business. We’re both on the lot. I’m not just some goon bothering him in a restaurant. I was ten feet away. He looked so much more serious in person. How’s the film coming, Jack? “Hey, do you know where the john is around here?” Jack said. “Oh, there’s one upstairs. Follow me, I’ll show you,” I said. “Sorry, that’s the only one I know,” I said, and Jack rushed back through the door at the bottom of the stairs. James Stafford: Piss Boy to the Stars. “So what did you find?” Michael asked. We sat at his kitchen table. “It just sounds funny,” I said. “Ken-do at a do-jo in Little Toky-o. For the next few weeks I went to the office early every morning and sat at my boss’s desk, typing away on his Macintosh, trying to be a screenwriter. In the evenings Michael and I reviewed pages, which consisted mostly of striking out my Looney Tunes humor in favor of ’80s-style action. We had guys with AK-47s hidden beneath their dusters. We had hot rods and half-naked babes. We had neon, slow motion, and mullets. We had ponytails, sunglasses, and stilted dialogue. We had your basic Shane Black “guy clinging to the hood of a speeding car” opening. I hated it. I couldn’t bring myself to hand the finished script to one of the producers. It seemed presumptuous and arrogant. I was a piss boy, not a writer. I stuck the script in a box and tried to forget about it. About halfway through the season, one of the scheduled Tales From the Crypt directors backed out and took his script with him. The producers scrambled and found a last minute replacement, but they needed a script. They bought one from the office receptionist, who had been writing between phone calls. What’s the moral of this story? I’m not sure, but I think that it’s this: When faced with a great opportunity, be sure to scout out the location of the nearest restroom. Jack can only wait for so long.